The AFV Club Churchill has finally given us a much broader range of options on this particular vehicle. To widen the build choice even further, Resicast have already provided a new AVRE Cast Turret Set (35.1202), to convert the Mk III AVRE to a Mk IV, a set of Early Pattern Tracks Set (35.2311) and some useful Stowage (35.2312), along with a Churchill Engine Set (35.2308), a new Deep Wading Set (35.2310) and with this latest addition a useable Fascine Carrier Frame (35.2322). Reviews on these products can be found Here on Armorama. 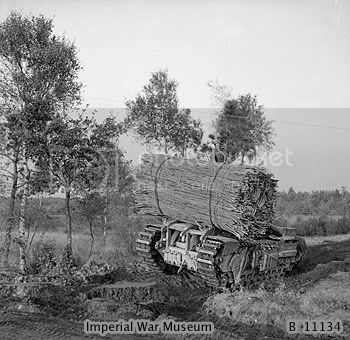 With the addition of a simple wooden frame the standard AVRE Tank could be converted into a Fascine Carrier. Fascine’s were used to fill ditches and large holes in the ground to allow other armoured vehicles to cross the obstacle. The Fascine was made from rolled bundles of branches/poles cut from local trees and bound together. Frames were constructed from any wood and local materials that were available, and whilst the basic idea followed the same scheme there were many variations as this item was often discarded after the Fascine had been laid. The Fascine, when loaded, obscured the drivers’ vision considerably and you will see pictures with someone perched on top directing the driver! 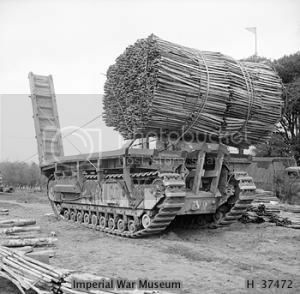 All in all a very British affair, but very effective none the less for crossing anti-tank ditches and filling large shell holes. The set comes in the standard Resicast zip plastic bag with a paper insert showing the mounted Fascine Frame on a Churchill AVRE, and carries the manufacturers details on the front. Inside are 3 further zip bags containing the kit parts. The parts themselves are moulded in a light grey resin, and all were free from air bubbles or damage. So what’s inside? This contained the 3 main sections of the frame. The wooden frame is nicely done with textured wood and the screw bolt holes on either side. These sections are numbered A, B and C for easy identification. Note from the instructions: “The Centre Frame is the only specific part, all others can be swapped around, used or not...” . There is a little flash to clean up and you will need a sharp razor saw to remove the mould plugs, but clean up should be minimal. This contains the remaining parts of the frame. You get 3 x parts G which are the Cross Members, 1 x part D, E and F which are the Main Cross Members, 4 x part H which are the Cross Member Shorts and 2 x part I which are the Angle Reinforcements. Again these have nice wood texture on both sides and appropriate screw/bolt holes have been added. Again simple separation and minimal clean up is all that should be required. This contains part J x 2, shackles, part K x 2 which are 10 ton shackles and part L x 1 the quick release mechanism. All these parts are well cast with good detail. These come in the form of 4 pages. The front of the instructions show the listing of kit parts, some advice on finish and a picture of the completed frame on an AVRE. The next page shows the build sequence for the frame in clear B & W photographs with the kit parts clearly identified. The third side of the instructions contains details of how the Fascines were made should you wish to make your own, and pictures of how they were attached to the Fascine Frame by means of cables linked to the quick release mechanism supplied. Page four has two further pictures of the Fascines mounted on real vehicles. Note: No actual Fascine material is supplied with the kit which consists of the frame and shackles only along with the quick release mechanism. However, these should be reasonably easy to construct and the instructions give you some ideas on what to use if you need to make one. If you are going to add a Fascine to the vehicle, then you will also need some cable and I would suggest you study a few reference pictures of the actual loaded vehicle to aid your build. What we have here is another really useful accessory for the AFV Churchill AVRE to join the growing number of build options being offered by Resicast for the new AFV Club kit. Fascines were also used on the ARK Mk I so a bit more variety there if you need it, but study your references as the back of the frame would probably need to be braced, as the ARK lacked a turret for it to rest on. The question must arise, “Why not build your own”? Well you could from plastic strip and by cutting all the right angles and gluing it all together, but for me this is a much easier option and I also now have a template for a self build if I need another. This simple frame opens up lots more possibilities for the modeller, get a few good reference pictures if you’re loading a Fascine on top of the frame, or simply make one and roll it into a ditch and the options for display are yours for the making. 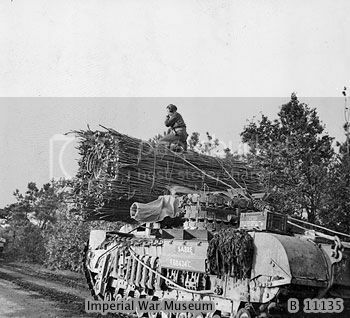 Not many pictures exist of the Mk III AVRE and all of the Fascine frames I have seen are leaning against the Mk IV turret, so if you choose to add it to a MK III you may need to adjust accordingly. Highs: A simple, effective Fascine frame to add to your choice of build options on the Churchill AVRE or ARK Mk I. Lows: Some cables would have been handy. Here's another one Grand view from up there. Can you tell us what are some of the suggested materials for constructing the fascine. I think the TC is just standing on the turret top, so this is not a combat picture.